Welcome back….to the creation of boxers! Treceder Boxers was purchased from a man in Texas by one of the original founders Hollis Stewart. 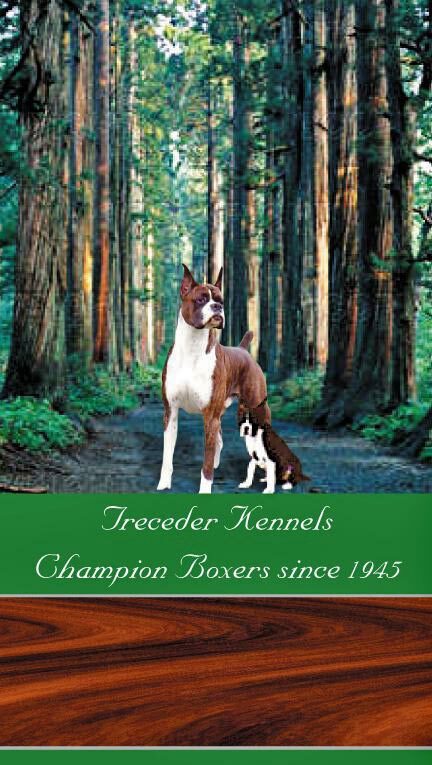 Treceder became a license Kennel with AKC September 20,1945. When one of the founder’s Ann Harr passed away my husband John and I were given the honor to take over the Treceder name. Currently my granddaughter Jordyn and I are combining our efforts to get back in the ring with some very promising young pups. Please stay tuned for our current show results. Treceder Kennels © 2019. All Rights Reserved.